More than 100 schools, including schools in Dearborn, Clintondale, Melvindale, Redford Union and Hazel Park, could be left without substitute teachers Tuesday morning as a substitute teaching group has abruptly shut down. 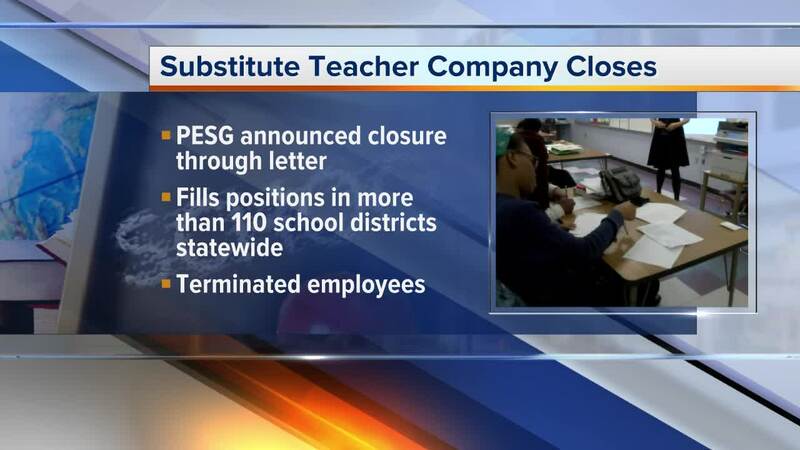 In a letter sent out Monday night, Professional Educational Services Group (PESG) announced it was stopping all operations in Michigan immediately and anyone employed by them would be terminated as of Oct. 22 which was Tuesday. The group says that it affects between 1,500 and 2,000 substitute school teachers throughout the state. On top of that, they had as many as 15,000 individuals registered with the group at about 110-120 school districts. They are now encouraging anyone to who was employed by the group to contact their local school districts to sign up and obtain work directly from the districts. Right now, it's not clear what districts the shutdown will affect, but Dearborn Public Schools said there will be delays in getting some substitutes to the buildings by Tuesday morning. "Please be patient and understand that we have a plan in place and will be utilizing all of our resources in order to ensure coverage at our schools," the district said in a statement. "Our staff has pulled together at a very critical time to manage this situation and we appreciate your support during this extraordinary event." It isn't clear how many other schools in metro Detroit will be affected by the shutdown, but we're told some schools in Macomb County are also impacted. 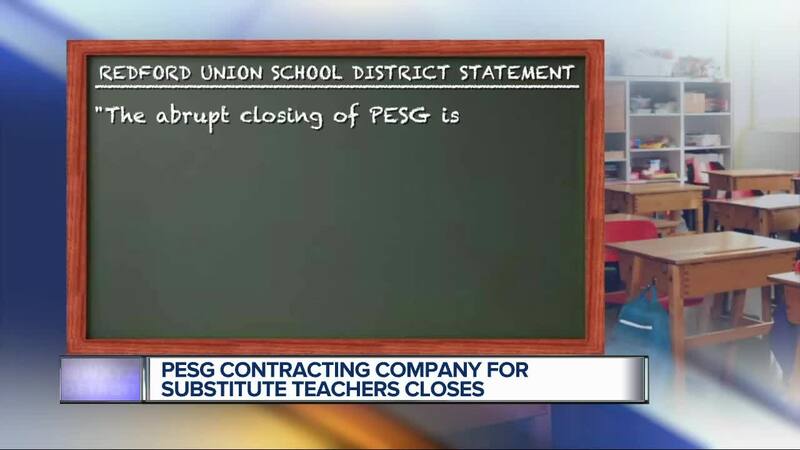 According to PESG they tried to stay open but negotiations to sell the company fell through over the weekend. 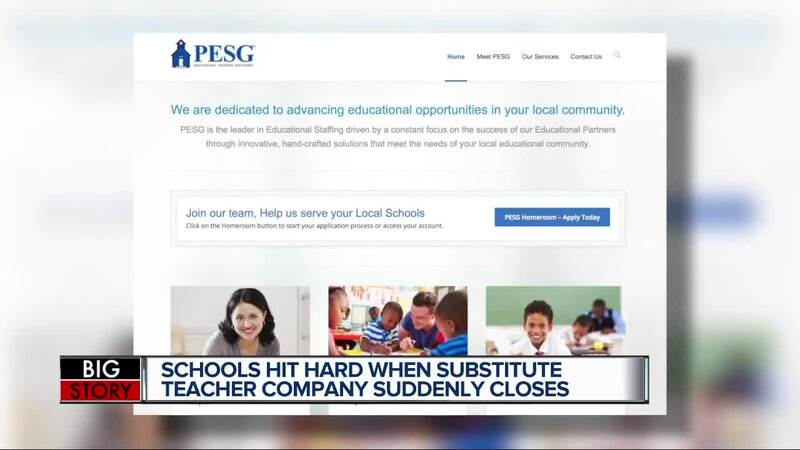 PESG said in a statement that those who work in the days leading up to the shutdown will still get a paycheck from the company or the district at the next regularly-scheduled pay cycle or as soon as possible thereafter. They are asking people not to change their direct deposit on file with the company. Troy-based Kelly Educational Staffing (KES), a specialty service of Kelly Services, was disappointed to hear of PESG’s decision to close its doors in Michigan. Continuity of learning is critical need for the future of our children. Experience tells us an effective teacher is the most important school-based determinant of education outcomes. It is therefore crucial that school districts recruit and retain high-quality teachers in addition to having strong partnerships with knowledgeable companies. Kelly Services has been in business for more than 70 years and takes pride in delivering innovative, customized staffing solutions to clients. KES has more than 20 years of K-12 experience in providing valuable substitutes (many who the schools end up hiring on for full-time teaching positions). It’s our goal to make it easier for schools and school districts across the U.S. to do their job, while improving students’ learning outcomes. We are filling classrooms, decreasing costs, strengthening the quality of substitute teachers in schools, removing administrative burden, and providing powerful data analytics, all to support the mission of advancing student achievement. In response to the substitute teacher shortage, Dearborn Schools Superintendent Glenn Maleyko sent a letter to staff and students stating that 120 former PESG employees were signed on to temporary contracts with the Dearborn Public Schools. Those employees were then sent to assignments at schools throughout the district. "Our Dearborn Public Schools team came together to address a situation that came without warning," Maleyko wrote in the letter. Maleyko added the district will "evaluate all available options" in order to develop a plan to meet long term financial needs, but will not "rush into any long term solution."